BATTLE CREEK, MI, August 20, 2018 — It's easy to get stuck in a career and feel like it's going nowhere. Karyn Quick shows, in her new book, there's a proven system to move women forward in their careers. The combination of the right knowledge, mentality and strategy can change a woman's career. 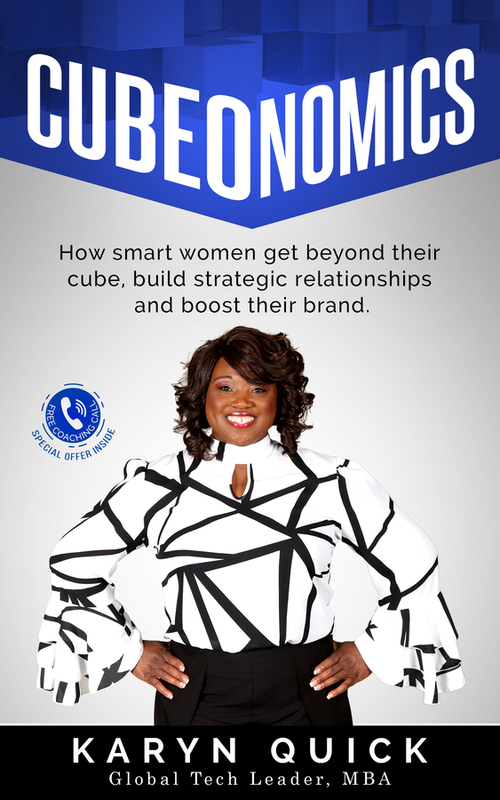 Global Tech Leader, Speaker, Coach, and Bestselling Author Karyn Quick offers a good dose of these vital ingredients in her new book, “Cubeonomics: How Smart Women get Beyond Their Cubes, Build Strategic Relationships and Boost Their Brand”. The early response to “Cubeonomics” has been passionate, showing this approach was something many women were missing in their work lives which is why the book went bestseller during its first two days of being launched. According to Quick, “Cubeonomics” addresses four key challenges she has faced and have seen other women face resulting in them being stuck in a work environment that is still heavily weighed in favor of their male co-workers. The book breaks each down and provide quick tips that can be leveraged by women who are willing to act and follow the advice to progress to the next level and beyond. They include breaking mental barriers that could be holding back success, gaining visibility, learning how to build strategic relationships, and the strategies behind how to boost a personal brand. In addition, to her ground-breaking work as an author, Quick is happy to offer informative and fun speaking sessions in her own unique eye-opening style covering things like Women's Retreats, Corporate Leadership, College & University Keynote Speaking, Corporate Leadership, Technology Workshops, Recognition Events, and much more. Details can be found on her very easy to navigate website. Readers reviews have been quick to endorse “Cubeonomics: How Smart Women get Beyond Their Cubes, Build Strategic Relationships and Boost Their Brand”. For more information, be sure to visit https://www.quick6wins.com. Karyn Quick is a Global Tech leader, Speaker, Coach, and Bestselling Author irrationally passionate about helping talented women get unstuck and get the payment and promotion they deserve! From just starting out to mid-career, she gives you the quick steps you need to jumpstart or reignite your career. She is a proven leader and has served as a coach and mentor to leaders in four of the seven continents in the world. To name a few locations: Brazil, India, Singapore and Netherlands and many more. She is a recognized speaker on the topics of career development, success, resilience, tenacity, fear, networking and leadership mastery.